A judge has ruled that if your phone is seized by the police, it's completely legal for them to send and receive text messages pretending to be you to try to convince your contacts to incriminate themselves. What? 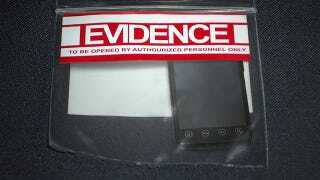 Story goes, in 2009, police seized a phone that belonged to Daniel Lee, a suspected drug dealer. And then the phone received a text the cops presumed to be a request for drugs. "[Detective John] Sawyer spent about 5 or 10 minutes looking at some of the text messages on the iPhone; he also looked to see who had been calling. Many of the text messages that Lee's iPhone had received and stored were from individuals who were seeking drugs from Lee." "On his own iPhone, on his own computer, or in the process of electronic transit, Hinton's communications are shielded by our constitutions.But after their arrival, Hinton's text messages on Lee's iPhone were no longer private or deserving of constitutional protection."